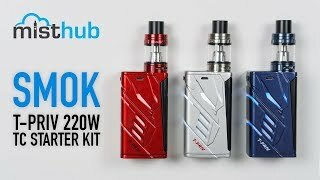 The SMOK T-Priv Kit with TFV8 Big Baby Tank follows in the footsteps of SMOK’s world-famous H-Priv Kit putting forth an alluring kit that employs many of the G-Priv’s most attractive features in an all-new futuristic body that is slender, stylish, and quite unlike anything SMOK has done thus far. 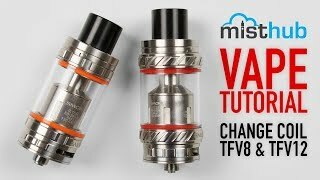 This high-tech kit combines the powerful 220W T-Priv with the tried-and-true TFV8 Big Baby Beast Sub-Ohm Tank, which is compatible with SMOK’s extensive line of V8 Baby Core atomizer heads and promotes an authentic SMOK vaping experience that continues to get better from first vape till last! The sleek and attractive T-Priv mod is fueled by two external 18650 batteries in series (batteries not included) and is constructed out of a durable Zinc alloy to compliment the chassis’ rugged framework. This eye-catching device stands at 86.6mm tall and a slim 48.1mm wide, measuring both shorter and thinner than SMOK’s flagship H-Priv device while maintaining an ergonomic and compact form-factor that fits well in the hand. Unlike the former H-Priv and G-Priv designs, the chassis of SMOK’s futuristic T-Priv mod features a “hollowed-out” body with multiple cutouts that allow a glowing LED to shine through that’s color-changing and customizable with one of nine unique LED color schemes. The T-Priv is outfitted with SMOK’s trademark side firing-bar that stretches from the top to bottom of the device, providing a massive firing bar that’s easily accessible from any handheld position. Like many of SMOK’s most successful devices, the T-Priv retains an elegant three-button design for seamless alteration of the device settings while promoting an intuitive vaping experience that’s easy to use and reasonably straightforward. The luminous OLED display screen sits on top of the mod and offers a refreshing change from the prevalent “Alien-esque” User Interface that’s become commonplace for many of SMOK’s latest devices—brightly displaying all of your live vaping stats (wattage, temperature, draw mode, puff counter, puff duration, voltage, battery power, resistance, individual battery life indicator) for a clear and concise readout of your current vape settings. The T-Priv is equipped with SMOK’s premier TC chipset and offers accurate Temperature Control functionality over Nickel, Titanium, and Stainless Steel coils (200°-600°F) for your all day TC vaping pleasure. This device is 510 threaded with Gold-plated contacts and is compatible (no over-hang) with atomizers that measure 24.5mm in diameter or smaller. Similar to SMOK’s “Alien” series of mods, the batteries can be changed quickly via slide-out battery cover on the bottom of the device, or charged with the included Micro USB cable via computer or USB wall adapter. 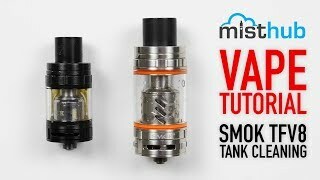 The included 24.5mm TFV8 Big Baby Beast Sub-Ohm Tank has made an appearance in several of SMOK’s most influential starter kits, complimenting the T-Priv with its long-lasting 5mL e-liquid capacity and intuitive top-fill swivel cap design, which give this tank precedence in the over-saturated market of sub-ohm tanks. Measuring at 56mm tall, the Big Baby Beast is constructed out of Stainless Steel and heat-resistant Pyrex glass, which effectively cools down the tank and dissipates heat during those hotter drawn-out vapes. SMOK includes a wide-bore Delrin mouthpiece to maximize cloud output and their notorious top-fill swivel cap for fast and painless filling when in a hurry or on-the-go. The Big Baby Beast caters to both Mouth-to-Lung vapers as well as the Direct-to-Lung vaping style, thanks to the free-spinning dual adjustable airflow control ring found at the base of the tank. Perhaps most impressively, the TFV8 Big Baby Beast is compatible with SMOK’s extensive line of V8 Baby atomizer heads, providing extensive options in the replaceable coil department to meet the needs of every preferred vaping style. Pre-installed inside the Big Baby Beast is the 0.4 ohm V8 Baby-Q2 Core atomizer head. This flavor-driven coil is constructed out of high-grade Stainless Steel and is wicked with pure organic cotton, promoting its “deep and rich cloud taste” at wattages between 55-65W. If you’re primarily interested in blowing massive clouds over everything else, SMOK has got you covered with their included 0.15 ohm V8 Baby-T8 replacement atomizer head. This high-powered coil head maximizes cloud production with SMOK’s revolutionary Octuple Coil design, which provides massive cloud production with its quadruple vertical parallel coil setup (rated at 50-110W). Each coil featured in this kit has its specific strengths, although one truth remains across the board: The V8 Baby platform of replacement atomizer heads can bring the flavor. The SMOK T-Priv Kit with TFV8 Big Baby Tank offers an attractive alternative to many of the dual-18650 devices on the market today. If you’re looking for a stylish new kit that brings the flavor and dares to go where no one has gone before, the T-Priv with Big Baby combo provides a highly-enjoyable vaping experience that simply cannot be beat.